A grid-connected solar PV system uses solar modules as the power generation source. When the sun shines on the solar panels, DC electricity is generated. The DC electricity is fed into an inverter which changes the DC power output of the solar array to AC power compatible with the regional power grid regulations at the installation site. The system allows for any on-site loads to be powered by a combination of power generated by the PV system and power drawn from the mains power grid. Excess power generated by the PV system will be exported to the power grid. 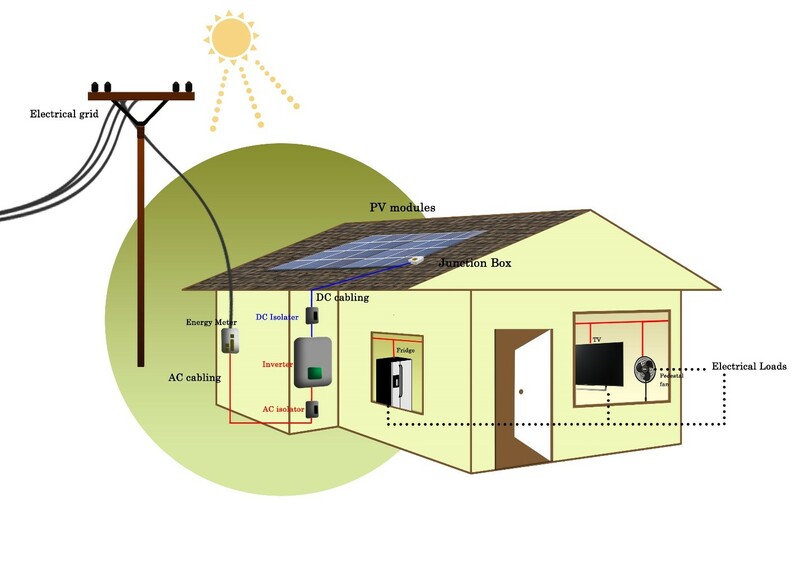 The major components of a grid-connect PV system are depicted in the figure below and include: . Sunlight is converted into electrical power via the photovoltaic effect. The electrical power produced is direct current (DC) like a battery, which cannot be used by normal electrical equipment in a household straight away. The current coming from the Solar Panels is converted into AC inorder to make the energy compatible with standard electrical equipment. The inverter deactivates at night and automatically starts operating in the morning when sunlight is sufficient. The inverter is the operations centre of your Solar Power System and as such, useful system information can be obtained from the inverter's display. An additional AC Isolator Switch connects the Solar Power System to the existing infrastructure. It also protects equipment from being harmed by eventual over currents from the inverter if it is in a faulty condition. In most cases, older energy meters will be changed to a Bi-directional Digital Energy Meter when the Solar Power System is installed at a house. Regen Power will get approval from the electrical utility companies before the system is installed.